Bikers love to ride. We ride with friends, we ride with family, and we ride just to be alone. Sometimes we ride to work, ride to the store, ride to birthday parties, and sometimes we get to ride where we want to go. So when we think of The Last Ride, where would you want to go? Certaintly not to work or the grocery store. Where is your ideal ride, and where would you want your last ride to be? Not something that every biker wants to have on their mind. But, What IF? That’s where the American Motorcycle Hearse Association comes in. Members are spread across the U.S and offer a range of services. 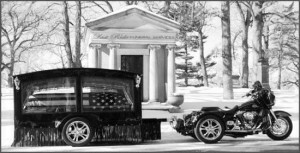 From riding past your house or a loved ones resting place, or it can be arranged. It just goes to show you what a bike is capable of pulling. Although trikes have a major advantage in stability, they do not provide the “feel” of riding on two wheels. Not that I won’t find myself on one someday, for now I will enjoy the two wheels that I am fortunate enough to have. So where do you want to say your last ride was? What was your last ride before reading this? Would you want that story to be your last riding story? When designing a ride or planning a vacation, reframing that as “it could be the last one” might help get over that long leg or whatever cost. Whether it’s a side-car, pulling a trailer behind a motorcycle, or trailering the whole show just to get there and relax, worrying about storage should be low on to-do list. Becoming a seasoned rider and knowing it all is down a long road for me, one that I will be sure not to travel in one of these trailers behind a motorcycle for a long time.